A newly published study relies on 10 years of observations from a slew of well-known telescopes to sort through that chaos and reveal what seems to have happened when a star met a black hole at the centre of two colliding galaxies. In January 2005, the William Herschel Telescope in the Canary Islands first spotted bright infrared light coming from a set of colliding galaxies 150 million light-years away. Scientists continued watching the scene for the next 10 years, using the 10 telescopes that make up the National Science Foundation’s Very Long Baseline Array (VLBA), the Spitzer Space Telescope, and others. At its brightest, the flare outshone its parent galaxy’s centre in the infrared and radio region, according to the paper in Science. Whatever it was, it didn’t emit significant visible light, probably because the surrounding dust absorbed the visible light and re-radiated it as infrared. The observations, combined with modelling, led to a most-likely story. A supermassive black hole devoured a star around twice the mass of the Sun, tearing it in half — a tidal disruption event, or TDE. The black hole’s gravity sucked up some of the matter from the star, creating a bright flare. It also produced an outward-moving jet of particles, whose resulting radio waves were visible to a network of telescopes on Earth. 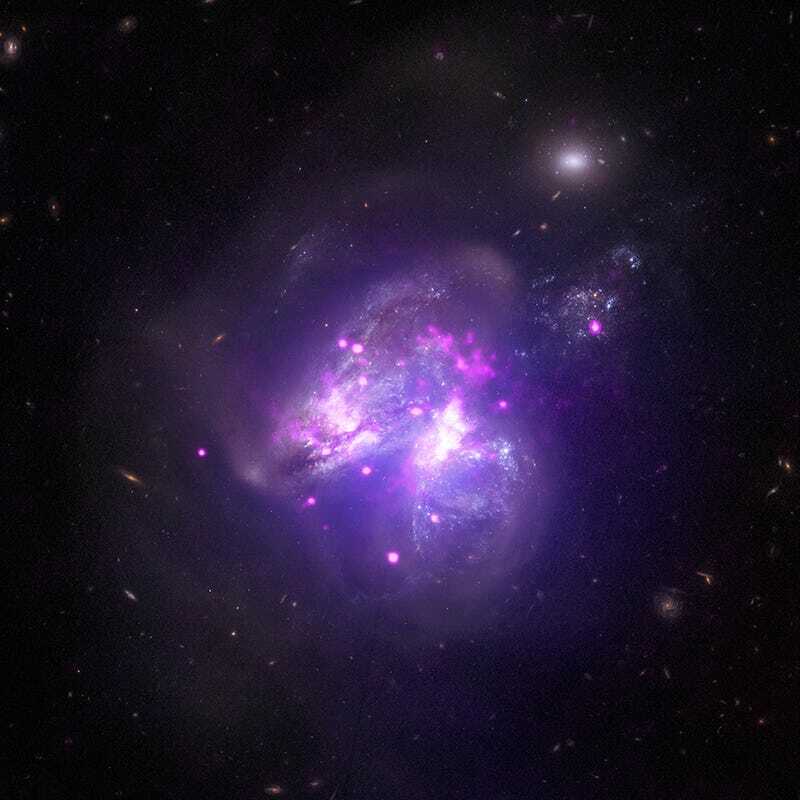 Two colliding galaxies, known as Arp 299. This would be the first time scientists were able to spot such a jet from a tidal disruption event. It also provides a way to help locate more black holes in the future, based on this signature emission. You may think the flare could have been an active galactic nucleus — a galaxy with constant bright jets emitting from its centre. But observations implied that the angle of the jet to Earth, combined with the orientation of the dust disk surrounding the black hole, was instead a TDE. Another scientist, Clive Tadhunter from the University of Sheffield, told Gizmodo that “the association of a jet with a particular type of accretion event — the tidal disruption of a star — could potentially improve our understanding of jet formation in general,” regardless of what formed the jet. There are limitations to the new research, of course. Bevin pointed out that the paper partially relied on computer modelling, so even though the scientists are using on the best available models, there are other possibilities as to the source of the bright flash. She also noted that others might be quick to make assumptions in their own observations, but this paper demonstrates just how much work and how much time it took for the scientists to conclude they were spotting a TDE. There’s tonnes more research to be done on these kinds of events. Better surveys such as the upcoming The Large Synoptic Survey Telescope will also map more of the sky faster, hopefully locating more potential TDEs for scientists to study.